“ACell is a method of tissue engineering that I have been monitoring closely for many years. The term ‘tissue engineering’ was coined in 1988. It is defined as the application of the principles and methods of engineering and life sciences toward the fundamental understanding of structure function relationships in normal pathological mammalian tissue, and the development of biological substitutes to restore, maintain, or improve tissue function. ACell is an extracellular matrix derived from the porcine basement membrane of bladder (from the basement membrane of a pig’s bladder). An extracellular matrix is the tissue between the cells; it is composed of collagen and fibronectin. It is also composed of “gags” glycosaminoglycans. A number of the components of extracellular matrix are bioactive molecules. Extracellular matrix also acts as a potent modulator of cell behavior. A number of growth factors can be found with extracellular matrix including VEGF, BFGF, EGF, transforming growth factor beta, keratinocyte, hepatocyte growth factor HGF, and platelet derived growth factor. There are additional growth factors as well. Extracellular matrix has been noted to act like a mediator of cellular behavior. In other words, when the matrix is placed in the injured tissue it attracts and stimulates cells. It attracts important components of tissue regeneration, which are stem cells. You could say it acts like mom’s good cooking and brings the family to the table. Essentially, it tells cells what to do and when to do it. It also stimulates them through a variety of growth factors. The extracellular matrix acts as a scaffold for the stem cells. Stem cells are pluripotent. The extracellular matrix helps to differentiate them into cells that will produce a single structure. The one concern we have with ACell products is a possible allergy to any component of the pig or porcine. Most people do not display an allergic reaction to pigs therefore ACell is thought to be safe for most individuals. What does ACell do? When ACell is applied onto injured tissue, it can stimulate the regeneration of normal tissue. It is not going to re-grow an entire arm that has been cut off, an entire liver that has been removed or an entire finger that has been excised. It will, however, help to regenerate small areas of tissue. What has ACell been used for in the past? ACell has been used to re-grow esophagus tissue that has been excised due to cancer, bladder tissue that was excised due to cancer and a tympanic membrane. ACell has even been used to re-grow muscle over a soldiers leg wound and has been able to increase muscle performance by 15%. In this latter situation, ACell was applied to the quadriceps of a soldier who had suffered a traumatic injury, and the loss of the majority of his quadriceps muscle, in a Middle Eastern front. The ACell was applied to this area and the soldier was able to re-grow functioning muscle tissue that resulted in an improvement in muscle function by 15%. ACell has also been used to treat damaged heart, or myocardial, tissue that was injured subsequent to a heart attack or vascular inclusion. What is our interest in ACell? Our interest is in the use of ACell to re-grow normal skin tissue in our extraction sites. We are currently applying ACell into our extractions sites with the hope that it will re-grow normal skin. We also apply the ACell into the extraction site with the hope that it will stimulate or attract stem cells from the extracted hair follicles and induce them to produce normal hair. We apply ACell to our grafts, as well, in case any grafts are injured such that it may repair any injury to the grafts and improve our overall yield. Of course ACell also contains growth factors, much like PRP. PRP, or Platelet Rich Plasma, is exceedingly rich in growth factors. ACell has growth factors of its own; therefore, the ACell should help stimulate healing and promote faster healing. What do we know about ACell thus far? We really don’t know much about ACell with regard to hair restoration surgery at this time. We have seen some reports by Jerry Cooley and Gary Hitzig. The reports thus far seem to be inconclusive. It appears that the ACell was used primarily to treat strip surgeries. The data from these colleagues is thus far lacking in evidence that ACell will prove beneficial in strip harvesting. My primary interest in ACell is in helping our donor areas take on a more natural appearance following follicular unit extraction performed by my method: the Cole Isolation Technique (CIT). Some individuals who undergo follicular unit extraction will develop areas of hypopigmentation where the hair was removed. These areas of hypopigmentation can lead to a phenomenon that some individuals refer to as a “moth ball” appearance. The application of ACell may help these unfortunate individuals develop more normal tissue and much less hypopigmentation such that the appearance of the extraction sites is aesthetically superior. I want to emphasize at this point that we are not certain whether ACell will function to reduce hypopigmentation. Indeed, hypopigmentation is primarily a function of lost circulation and a loss of hair pigment from the extraction sites; it really is not due to significant formation of scar tissue. Nevertheless, ACell may help to improve melanocyte stimulation and improve the overall appearance of the donor area. My second interest in ACell is to stimulate the stem cells which are left behind when we perform follicular unit extraction. Stimulation of these stem cells by ACell may induce the development of new hair growth. I feel that ACell is particularly well suited for follicular unit extraction. This is because, unlike strip surgery in which you extract the entire strip of tissue including the adipose, the hair follicles, the dermis, and the epidermis, we remove only the outer dermis and the hair follicles in FUE. The remainder of the tissue, including any residual stem cells related to the hair follicles, is left behind and intact; I emphasize fully intact. This is why scarring from follicular unit extraction is always less extensive than scarring from strip surgeries. The extractions by my method of follicular unit extraction, “CIT”, are far less invasive than strip surgery. So, the hope is that through our proprietary method of delivery of ACell to our extraction sites, we will be able to attract and induce hair follicle stem cells to reproduce a re-growth of the extracted follicles. I close this paragraph by emphasizing that we have not yet seen any evidence that ACell promotes any new hair growth. The reason we have not seen any significant benefits from ACell thus far is that we have been using the product only for the past month. I wanted to wait for some time after the release of the product to evaluate its safety profile. You may be aware that I have been following ACell very closely since the spring of 2007. At that time, I was impressed with ACell’s ability to re-grow the tip of an amputated thumb. However, at that time, ACell was not indicated for use in humans. As such, I wanted to wait for FDA approval for use in humans, and also to evaluate the safety profile of the product. My primary concern, once again, with ACell was an allergic reaction to porcine products. As you may be aware, ACell is derived from the basement membrane of the pig. It is washed, cleansed and sterilized prior to delivery to the physician’s office. In my opinion, it is an extremely safe product. There’s a great deal more that can be said about ACell and we will expand on these thoughts in due course. It is very important for everyone to recognize, at this time, that there is no conclusive evidence that ACell stimulates the regeneration of new hair. There is, however, substantial evidence that it regenerates new skin. From the standpoint of hair regeneration, ACell remains experimental. From the standpoint of regenerating new skin, it is a proven modality that may work to a variable degree depending on the individual patient. Even should ACell fail to stimulate new hair growth, it almost certainly will improve the overall aesthetic appearance of follicular unit extraction sites in the donor area. ACell is a very expensive product; we have purchased a considerable amount of it. We are offering it to our patients with explicit informed consent at a price that does not exceed our costs. Of course, patients are under no obligation to receive ACell treatment. The objective going forward is to unlock the specific methods necessary to regenerate hair. Given that ACell has successfully regenerated muscle, skin, nerves, specific organ tissue, etc., we see no reason why it cannot regenerate hair. It is left to us to engineer a specific means of delivering the product to the appropriate stem cells. » evidence that ACell will prove beneficial in strip harvesting. (PRWeb UK) January 28, 2010 – Researchers and hair restoration surgeons Dr Gary Hitzig and Dr Jerry Cooley created a technique that multiplies the number of hair follicles in an area that had been dormant using an FDA-cleared wound healing powder, but they stipulate it is not fool-proof yet. Dr. Cole can do whatever he wills with ACell. Infact, more power to him for pushing the envelope. I condone his use of ACell to see what we can learn from it in actual numerous resulted attempts. However I am totally against the notion of Dr. Cole charging his patients, where he even admits to MAY OR MAY NOT WORK. If you want to use patients as guinea pigs (with their consent of course), then you shouldn’t be charging for an unknown procedure that may or may not work! What’s next? Research companies will turn things around and rather than paying their guinea pig subjects (people) they’re going to have the subjects pay to be tested on??? You’re trying real hard to justify your use of ACell and charging for it. It’s not working. Every single paragraph and sentence, as sincere as they TRY to make it sound is another business tactic to get more patients and more dollars. Everytime I named top HT surgeons in the past Dr. Cole’s name was on that list. This was before I read his announcement that he is now offering acell and charging for it. Desperate failed attempt to make more money imo. Use ACell, we are all for it. You are not sure if it will work or not, yet you charge for it. That’s WRONG. » going to have the subjects pay to be tested on??? » You’re trying real hard to justify your use of ACell and charging for it. » charge for it. That’s WRONG. Acell has proven to do jack squat as a hairloss protocol. It hasn’t even proven to be useful for scar revision. Maybe it has some use in treating initial wounds to reduce scaring, but even there Dr. Jones showed that it didn’t really do much. Acell seems to be nothing more than another way for HT docs to upsell their procedures. Until REAL double-blind studies are conducted and REAL objective data (i.e., not compiled be the people who have an interest in selling it lol) assembled, I won’t believe a thing that’s said about it. The stuff is FDA-approved already. If it grew hair then these clinics could find out and produce proof in a matter of months. Nobody is providing proof because it doesn’t work. If half the HT world wants to wait around for proof for 5 years while they rake in money telling lies (Like a certain clinic’s unproven 15,000-graft FUE donor areas), be my guest. But I’m not buying any of it. » that’s said about it. Although the claim has been made that two hair follicles can be produced from one (30–70% success rates are anecdotally quoted in the hair transplantation field), the fragmented follicle approach to achieve follicle multiplication has not been critically evaluated or generally practiced. This is just an extract out of a very importent reasearch paper, written in 2007 by some of the most experienced (and trusted) hair researchers on this planet. Anyway, 30–70% success rates WITHOUT any regenerativ medicine?? In regard “has not been critically evaluated or generally practiced”, TODAY guys like Dr. Jerry Cooley, critically tries to evaluate that all - but this time in addition WITH the help of regenerativ medicine like ACell. So what will be the outcome? Nothing? Thank you for your responses. We understand that there’s controversy in this treatment but we believe such controversy is useful in driving the advancement of medicine. ACell is not experimental with regard to tissue regeneration and is, in fact, FDA-approved for this purpose. Although there is little doubt that ACell will help regenerate normal skin tissue, we do not yet know whether it will help regenerate hair. Unlike Dr. Cooley, Dr. Cole’s interest in ACell is not to improve the appearance of strip scars. Dr. Cole’s procedure of FUE, which he calls CIT, already produces a better aesthetic result than any strip procedure. We already know that Follicular Unit Extraction leaves the best aesthetic result in the donor area. With the use of ACell, Dr. Cole believes we can further improve the aesthetic appearance post-transplant in this region. We are currently examining whether ACell is able to stimulate follicular stem cells in order to regenerate host tissue. If we do find a way to re-grow donor hair, in addition to achieving an aesthetically superior donor area, we’ll consider that to be a bonus of using ACell. Suppose that we find ACell does not re-grow hair. With a strip procedure, even if ACell were to re-grow three layers of tissue, a linear area of bald skin will remain. In addition, hair follicle growth will be distorted due to the removal of the ‘strip’ of skin. Hair growth angles above and below the excised region will remain distorted for the remainder of the patient’s life. This is why we have no interest in strip surgery and leave this procedure to other physicians for the most part. We believe that ACell has the best potential with FUE procedures and this is something that is only now being explored. Hair bisection studies have shown growth rates all over the place. Many of these studies may have been poorly performed and might simply reflect re-growth of an exogen hair. This is a different animal than hair regeneration, but it is also possible that an extracellular matrix could improve the survival of bisected hairs. Regardless, we prefer to focus on options that might work under the proper protocol any day, rather than simply giving up in the face of an obstacle. We should have some initial data on hair regeneration within a few months. If the initial protocol should fail, we’ll move on to the next protocol we’ve devised. I agree that should Dr. Cole make a profit on the experimental use of Acell, it should be regarded as unethical. However, Dr. Cole stated that he’s offering the product “at cost” to his patients. We don’t know the specifics of the meaning of “at cost,” as it can mean he’s selling it at the price at which he purchased the product, or it can mean that he’s making a standard, market-value profit. Therefore, if Dr. Cole is making a profit on unfounded uses of Acell, then I would agree that the practice is unethical. But, if he said that he has seen first hand the effects of the product, then I think he is right to charge, but not profit off of Acell. Also, these cries that Dr. Cole doesn’t have clinical “proof” for Acell is also unfair. As a surgeon, you see countless numbers of patients and get a very clear idea for natural healing capabilities, as well as its variability. Even without a strict, clinical study, it’s reasonable for him to claim that he’s observed improved wound healing or tissue regeneration. And if he is indeed not making a profit, then he stands to gain nothing by making such a claim. Blah, blah, blah . . . just show us the new hair. In half a year Dr. Cole will either have something to show or he won’t. » Blah, blah, blah . . . just show us the new hair. » In half a year Dr. Cole will either have something to show or he won’t. And he will have severely damaged his reputation, or he won’t. » » Blah, blah, blah . . . just show us the new hair. » » In half a year Dr. Cole will either have something to show or he won’t. » And he will have severely damaged his reputation, or he won’t. Can’t damage if the damage gets brushed beneath a rug. You and I will never know. We can only know if photos are taken of a few patients NOW stating “Patient A and Paitne B using ACell with pics taken today (today’s date)”, and then write “We will follow their progress”. Then we can request follow ups from those patients. John Cole is definitely one of the good guys in life. Ive met him twice. He has performed some repair work on me which Im quite pleased with. Everybody at his office has been nice and pleasant towards me. I haven’t been looking at this board (or any others) for a good while now until just recently. My hair looks good, especially for someone my age. Dr. Cole is definitely one of the better angels in cosmetic surgery. Ask yourselves this: If ACELL was a product that shown efficacy in dramatically minimizing scars in reasonably sized-wounds, but had never shown hairgrowth potential, wouldn’t you be glad doctors like Cole and Jones were trying it to minimize scarring? You should. Dr. Cole (and Dr. Jones) have had to learn a good deal about ACELL, contact the company to obtain some of it, and no doubt have had to train their staffs on its usage. Thats a lot of time and trouble taken on his patient’s behalf. A really good hair-transplant is a technically involved cosmetic surgery replete with anesthesia, miniature surgical instruments, a small amount of blood, tiny-eye-exhausting-headache-inducing-operative-minutaue (ever done any sewing or embroidering guys? This would be much harder…MUCH harder), all on a figety patient (like me– ), who is a bit nervous by nature anyway. Thats a hard job, and running an office like that, monitoring results, looking at ways to better the procedure, being mindful of marketing, and getting your employees paid…we are lucky talented and extremely intelligent men like Cole even fool with it. If you were in a car accident and needed extensive plastic sugery that included a chin-implant, a nose-job, and surgical reshaping of your face…would you rather go to a Lexus-grade surgeon (Cole), or to a used-car lot chain surgeon? Pretty easy to aswer that when its framed that way isn’t it? I think highly of Dr. John Cole. That man could be doing many other things and be highly successful at them. » of the better angels in cosmetic surgery. » Jones were trying it to minimize scarring? You should. Dr. Cole (and Dr.
» talented and extremely intelligent men like Cole even fool with it. » and be highly successful at them. Yeah, it’s good to hear from you again Benji. If you haven’t surfed the boards here in a while, we’ve had a recent blowup with Acell claims. It’s affecting what is being said on this thread. Dr. Cooley & Hitzig made some, umm . . . “misleading” . . . claims about making hair follicle regeneration progress with Acell. One of those things where a lawyer could argue they didn’t technically intend to lie, but any breathing human being can see the intention to mislead. We’ve just gotten pretty burned on Acell lately because we see signs of it going down the road towards the P.R.P. fiasco - it doesn’t work to regrow hair, but a bunch of HT clinics make some green selling it during the (strangely prolonged) testing period while the question does not have a firm “no” yet. We’d all like to see Acell help in any way, but we’re running out of patience on clinics selling unproven stuff while they test it. Show us the hair, show us the scars, show us SOMETHING . . . or stop asking for extra money for it. I think it is important to note that ACell is not a marketing tool or revenue generator for our clinic. If we were offering ACell with the intention of increasing our patient flow, concerns about our motive would obviously be justified. In reality, Dr. Cole’s calendar is full months ahead of time. When we have an unexpected opening, we have a list of patients, who cannot afford hair restoration or repair surgery, which we pull from and bring in for pro-bono work. ACell is a costly treatment and it is very time and labor intensive for Dr. Cole. Sometimes we do offer ACell treatment for free to patients who have, or will have, a severely depleted donor supply, but we generally pass the cost along to patients who opt to receive ACell treatment. However, to reiterate, Dr. Cole is not profiting from the use of ACell. When looking at hair restoration trends in general, it’s important to look at how far we’ve come already. When Dr. Cole started in 1991, over 99% of hair transplant procedures involved mini grafts or plugs. Dr. Cole entered the field, wanting to help the men he saw who were so distressed by their hair loss that they were willing to pay thousands of dollars for a “pluggy”, doll’s-hair appearance, just to have some hair. Dr. Cole was one of the founding fathers of follicular unit transplant surgery and was unquestionably one of the first surgeons to practice and promote FUE, which is where he earned his reputation. In my opinion, Dr. Cole is a pioneer in the industry and we can’t expect him, nor do we want him, to sit back and wait for things to happen. “There is reason to be skeptical regarding hair multiplication, hair regeneration, and hair cloning. With hair cloning I’ve been hearing “we may be successful in the next 5 years” since 1993. I don’t count Acell out entirely, but I have my own doubts as to whether we can regenerate hair follicles with Acell or through any other means. The concern I have is not so much with the potential of an extracellular matrix; rather, it is in the complexity of growing a hair. Hairs arise from two different sets of stem cells. One is of mesodermal origin, while the other is of ectodermal origin. The two stem cells must turn on genes in the exact required sequence in order to produce a hair. It is no wonder that this complex scenario has been so difficult to overcome and replicate. While it is easy to regrow and stimulate hair growth in a mouse, hair regrowth in humans is far more difficult. One of the concerns I have regarding Acell is the location of the stem cells. Many feel the stem cells are located at the bulge, which is just below the sebaceous gland. Jimenez has recently reported that stem cells are located from 0.8 mm to 1.6 mm below the surface of the skin. Such a close proximity to the surface of the skin may be the reason that the growth of hair through a trichophytic closure is so sporadic and inconsistent. If the edge of the wound is trimmed too deep, the stem cells may be discarded. Another concern is the layer in which the stem cells are located: if one set is on the outer surface, but another set is on the inner surface, then the application of an extracellular matrix might stimulate only the outer layer and have no effect on the inner layer regardless of whether a strip or FUE is performed. If this is the case, we might find success by mixing the two layers with an ECM to see if we can induce a follicle. No one ever said it would be easy or straight forward. The first trial will be to see if we can induce stem cell proliferation and differentiation by simply placing Acell into the extraction sites. If this fails, then we will follow this in an attempt to mix the various components of the follicle with Acell. If this fails, we will try to think of an alternative plan. Regardless, Acell is indicated for regeneration of skin tissue. The regeneration of normal skin in an extraction site will serve to make an already superior aesthetic procedure even better. Any way you slice it, Acell has great promise for treating the donor area. One aspect we will look for is an elimination of “white spotting” or hypopigmentation that may occur in some patients who undergo FUE. If we can get proliferation of melanocytes into such extraction sites, this alone will be a huge bonus. I see much less potential for Acell with the treatment of strip scars. Some of the greatest problems with strip scars are the distortion of hair growth angles. You cannot overcome this, even if you could get hair to grow through a scar. Furthermore, the regeneration of all three layers of the skin that are removed by a strip procedure would simply produce a line of bald skin, which would continue to be completely unnatural. Of course it could help with the appearance of the ideal trichophytic closure. Unfortunately, you cannot predict the outcome of a strip procedure and you cannot predict the outcome of a trichophytic closure. This is the primary reason to avoid them in my opinion. Few complain about an optimal result, but you simply cannot predict an optimal outcome. The application of Acell adds over an hour to a procedure, and it is extremely tedious. The delivery of the product is fairly complicated, as well. If the procedure has no benefit, we will not continue using it. While there are many skeptics, I am also sure that most people have their fingers crossed. » some reports by Jerry Cooley and Gary Hitzig. » aesthetic appearance of follicular unit extraction sites in the donor area. @Emilie11 - Any news to report in the meantime ? Similar results like Dr. Mwamba ? 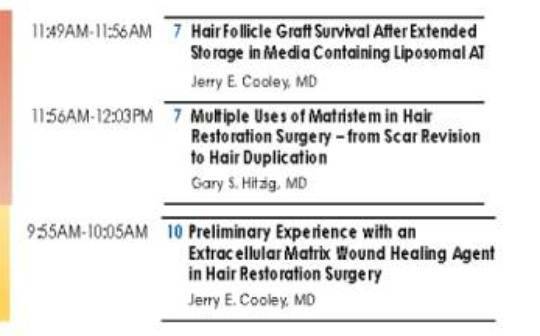 Is Dr. Cole aware of the fact, that both doctors, Dr. Jerry Cooley and Dr. Gary Hitzig, are going to present their findings at the annual ISHRS 2010 in Boston ? » » some reports by Jerry Cooley and Gary Hitzig. » @Emilie11 - Any news to report in the meantime ? » Similar results like Dr. Mwamba ? » Is Dr. Cole aware of the fact, that both doctors, Dr. Jerry Cooley and Dr. Does this actually mean Acell can produce donor Regrow? » Does this actually mean Acell can produce donor Regrow? » » Does this actually mean Acell can produce donor Regrow? In general it is really funny and also so simple but hey some FUE Docs are well like some kids in the sandbox. Its so funny all those docs seem to ignore the fact, that from year to year less people are actually going for a transplantation. But they not gonna do something about it. » » » Does this actually mean Acell can produce donor Regrow? » well like some kids in the sandbox.